It happens over and over. First: the offensive statement, the easily misunderstood opinion, the flattened phrase. A victim is created and shouts. They claim space, a part of the territory. Here I am. They say. Look, I’m bleeding. You hit me. You meant to hit me. In cyberspace, within the pixels, there is blood. Someone says the rules. One rule is this: they are always right. I do not know who made these rules, but someone says it, so it must be so. The sensitive and righteous tweet support and tell their own stories. They demand an apology. Twitter has spoken. They determine what will be a satisfactory penance. There are other rules, and there are hashtags. In 140 characters we will sort through all the mixed motivations of human desire. We will make it clear; we will judge, and correct, and make right with our succinct and brief tweets. I will feel good if I can make you feel bad. Or if you do not feel bad, if you at least retweet what I tweeted, unless it makes me look bad, then I will delete it. I have dishes to do and a living room to clean up and I should probably return some phone calls, but I must send this tweet because it will change someone’s mind, and it’s the perfect phrase that someone will notice especially if they have an amusing hashtag to add or maybe they will have a million followers and I’ll be noticed. Twitter shall not be for the nuanced, the thoughtful, or the reconciling. Those do not get retweeted. Then backlash against the hurt. There is a retort and a riposte. Who wins? The most clever, or the most retweeted? We love the attention, and then the attention is too much. Hugo Schwyzer needs meds and a little love; no, he needs to go away because the man is a trigger, and he triggers everything, and nobody controls over their emotions anymore, I will tweet everything, because patriarchy and feelings oppress us all. And so the outrage machine will make its little idols, through its perpetual series of distractions, puffery and self-indulgence. 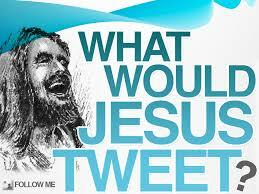 Twitter allows us to be like Gods, worshiped by our followers with retweets and personal messages. And then we do battle with other Gods. We need not seek healing, for we have these weapons in 140 characters. If there is the hope of winning, we will continue to place hashtags. He would look up from the screen. Last Sunday the Gospel Reading was on the Woman at the Well. The reading invites scandal: is Jesus flirting? Hey Babe, I’ve got something for you. She banters back, Really? Whaddya got, sailor? The story has a hint of ridiculousness: she’s saying, I’m not here for fun, I’ve got work to do, and I know what you want and you aren’t getting any. She even forgets her water bucket. Who was the woman? Easy? Loose? Sleeping outside of marriage? There’s pain and toughness in her, curiosity and astonishment. Who is this fellow who would talk to someone of the enemy tribe? Jesus is from the Jets and she’s from the Sharks. That’s a West Side Story reference. I don’t think it’s useful to avoid the passage’s edginess. Jesus seems to enjoy being the riddle here, enigmatic and obscure. And yet, he knows her, and has identified who she is. Then there is what is missing: judgment. Perhaps she had always been an extension of other men, sometimes protected, sometimes used, vulnerable at one age until reality made her tough, invulnerable to the critiques of others. I think the experience of transformation begins with being recognized, not as an extension of others, not as the cause of pain or pride for others, but by being seen as a person worth loving, without the burdens of what she was carrying. Perhaps that is what the living water, the running water is like: one where life is clearly flourishing, unburdened and unshackled by the fears and limits and shame imposed by other people. She was seen and recognized. And perhaps that was the beginning of her freedom. She didn’t need the water. And now words are getting spilled. I will add a few letters to the end of this era. Like all responsible mainline Protestants, he outraged me. He said what? How dare he! He was giving Christians a bad reputation. On the other hand, Christians were already doing that. I would get angry, imagine my own counter protest, invent signs in my mind. Once I grew tired of my own outrage, it became clear Westboro Baptist Church was barely a church. It was a family business. Nor were they in any sense effective: their outrageousness forced other Christians to moderate their equally pernicious language. Marriage equality continued. Possibly, because of the utter ridiculousness of his project, faster. I can’t think of a single religious person I know, or even one I do not know, who would want to be identified with the antics of Westboro Baptist. So all that anti-gay protesting? Theater. Not that WBC thought they were performing, but they definitely were. They were playing a part in orchestrating a response, one that was deliberate and scripted. I began to experience reading about Westboro as if they were a travelling sideshow. I found my own personal, perpetual, outrage morphing into a deep sense of incomprehension bordering on entertainment. I didn’t understand what they were saying or doing. They were a spectacle speaking a completely different language, whose intentions were obscure. And so the best responses to Westboro were ones that treated them like performance art. Counter “protestors” wrote signs like God Hates Figs. God hates Signs. God hates Little Tiny Fuzzy Kittens. When faced with hyperbole, go with it. Can I add a few? God hates low fat yogurt and toe fungus. Sometimes I feel WBC was a huge diversion. Many other groups not only teach the same beliefs, but they organize and lobby. That’s where we should be resisting. But it’s hard not to watch the circus. The internet asks for prayers, to not get caught up in returning hate for hate. Such a view is faithful and reasonable. But the ease for which I can do this is because, to be honest, I was never harmed by the man. His outrage was never my own. He was tired, angry, sick. He was pitiful. In the end, the play was outrageous, so he got what he wanted: attention. I gave some to him. But I’ll looking forward to the moment I don’t care. As our country forgets how to fear gay people, he will become a curio. Rumors abound that Phelps had gay tendencies himself. It fits what Episcopal Clergy have known: the closet is the most violent place for a gay person. That rage turns inward killing the soul; and it turns outward wreaking its own havoc. My real sympathy lies with his children and the abuse that they experienced first hand. I admire their resilience. So my wish? In heaven, he’s out of the closet, and enjoying himself for the first time. Let him become, instead, an angel who liberates others from the self-hate they find being inflicted upon others. I’ll let others bless the man. I neither celebrate nor mourn – the family and his enemies can do that. The rest of us? Now, to more important matters. The Alban Institute is shutting its doors. From what I can tell, it’s doing so wisely, acknowledging that its current structure needs to change. It was one of the first organizations that addressed the decline of mainline Protestantism and sought to equip pastors with the skills to understand and revitalize their churches. Most seminaries train their pastors to be good readers, counselors and ethicists. My colleagues are literate and trustworthy, people from whom I seek feedback. I find them intellectually astute, warm and genuine. But as a collective skill set, we learn organizational development and building institutions on the job. Most of us presumed we came into relatively intact organizational structures, but it has not been the case. Some can learn the skills intuitively, others have learned by participating in the workforce, but some clergy clearly have stronger skills than others. The Alban institute attempted to introduce sound management into churches, helping us think about the practical challenges of decline and transformation. They covered a broad range – from how to think of a church “system” to board development to stewardship. Their books were focused on being useful to pastors, and very attentive to the detail oriented, toolkits that pastors needed. What was always remarkable about many of the books Alban published was the repeated acknowledgment that if we really believed all this crap about God and Jesus, we could truly rebuild the church. When Loren Mead wrote about wealth, he put it bluntly. To paraphrase, we have to remember that we are rich, and we have been given a great inheritance. Only about talking about money honestly in the context of Jesus Christ can we rebuild our congregations. And we aren’t doing it. But if we recognized what we do have, we could change the world. It’s hard to hear. It was hard to say. And it’s hard to do. But many of us have found it hard to take risks he thought we needed to, and in that it’s harder to ask congregants to take the same leap. In the end, our “decline” has not been because of liberal theology, or of our prophetic witness, but one of leadership. We clergy, cursed with the desire to please and be nice, so that nobody else will leave, end up pleasing nobody. Which is why I think clergy should take up improv comedy and boxing. Still, the mainline church is not the only place where the spirit may work. Perhaps it did what it was called to do: in the US mainline protestants laid the moral ground work for important institutions and movements such as the United Nations, the Marshall Plan, and Civil Rights. I believe it sought to hold the country together, in an imperfect way, as we began living into our country’s promise. Now perhaps we need other, more nimble, responses to Jesus’ call. And so the role of priests and professional clergy will change once again. The economics are such that we will have some large congregations, and many house churches. Thank you, Alban, for your prophetic witness to what the church could be. You gave this priest hope. I didn’t know always how to bring you into my congregation, but God knows, you tried. What if clergy took their health more seriously? When the days of having multiple clergy, staff and an army of women volunteers ended, the work became fragmented, stressful, and demanding. Unprepared clergy suffer from depression and obesity – even if they know they love their work and the call. Especially the smaller church pastor is often underequipped to handle the demands of building management, event planning, and performance that are each separately stressful upon the body. I do not mourn the old days. I never knew them. And to some extent I enjoy the diversity of the workday and its challenges. My part-time staff is productive, helpful and supportive, so it’s manageable. I count my blessings, which are many. But it’s easy to get overwhelmed. And for this reason, I wonder that clergy should have a rule about health. It should be non-negotiable, and may save the lives of a few clergy, and of some congregations. And it might be like this. The first rule of a priest is go to the gym. Every day. Do it first. Before work. Do it also for the health of the church. Because a priest that does not make a concerted, deliberate effort to do this work, will less effectively set important boundaries in other areas. If it means postponing meetings until 11am, then do so. If it means that you aren’t in the office until 10 or even 12, get to the gym. Make it easy. If your gym has a locker, rent one. If you need to just practice going to the gym, get there, take off your clothes, take a shower and then leave. Put your clothes back on first. If necessary, assure the parish. This will make you more productive, happier and they will be happier as well. If they complain, we remind them that we want them to do the same, and find ways to be intentional about their own health. Getting to the gym at a later office hour will still require that the tasks get done. It’s not license to leave early; trust that the impact of the exercise has shown to increase brain power. The work will more likely get done. The consequences will have a cascading effect: exercise allows for better sleep; then it’s easier to workout again. The pastor will have more energy. What works for me? When I’m at my best I have a four day a week lifting program. It’s probably the only thing that keeps me going to the gym regularly. The other day I do a very light 30 minute walk / run. Admittedly, I’m not always consistent. But a “rule” of life is not meant to be a whipping rod to lash oneself with guilt but an orientation to live into. I recognize this is flip. But that first 20 minutes may change the nature of the day. It may begin with just walking. Wise priests might get a trainer or a coach for a few weeks to get started. I suppose there are other things about health that are probably central. Jesus hates soda, including diet soda. Addicts trying to give that up can allow themselves flavored seltzer water. And if thats not pleasing enough, try dark chocolate or beer. Jesus loves beer and dark chocolate. The other day I read about Tony Benn, who my mother idolized. He was passionate orator, and a political diarist. Good diaries can be compelling windows into an age, especially by discerning writers. Some use it to document feelings, to work through one’s thoughts. But I had one parishioner who made lists of what was done. I’m tempted to make it into a list of things I need to do. So yesterday I preached. The gospel was on Nicodemus, and his misunderstanding of Jesus. John divides the world into light and dark, and Nicodemus is from the dark, and so he is forever in the fog of misunderstanding, who can’t figure out the riddle Jesus. Who do we understand? Those who have suffered along side us, who’ve fought the same battles. And in a more balkanized society, where we are separated by class and by media demographic, we simply don’t understand what we think we do. A solution? To free us from that misunderstanding, we must try to hear one another. I referred to the Buddhists who would meditate on corpses in Sri Lanka, which would prepare them for burying the bodies after the tsunami. Only when we hear, see, contemplate the stories, can we carry them, recognize them in others. I made the analogy that seeing the serpent was like inoculation – and perhaps the cross is like that as well. The cross casts light upon the suffering of others. After, I taught on the Apostles creed. We discussed hell. I went to a wake for a well-loved deaf priest who lived in the area. At the funeral home I saw the mayor and his wife and a couple parishioners who knew his son through boy scouts. Sometimes when I see a local politician I feel like we have a lot in common because we have to please a lot of different people. I’m not sure if that’s a good thing. Theoretically I have a lot more freedom, but then, I restrain myself. I said a few prayers from the prayerbook, which were translated by a signer. I went to the library where a local buddhist temple was making gifts for clients of Meals on Wheels of White Plains, where I am a board member. The temple is supporting a lot of public projects. It feels a lot different than other institutions – they make no effort to evangelize, but have become much more involved in the variety of institutions in the area. They have even started sending one person to the White Plains Religious Leaders. I almost went dancing, but my friend’s aunt died. So we ordered pizza, opened up a bottle of Pinot Noir from the Languedoc Region (not a classic, but perfectly tasty), and watched Monty Python. That means I’m formed by the Episcopal Prayerbook, called the Book of Common Prayer. It doesn’t mean I can’t say or write my own prayers. And it’s not my book because I’m a priest. It’s a book for everyone. I’ve heard people say they believe only in spontaneous prayers from the heart. But there are times I don’t have the words. I’m perplexed, tired, or unenthusiastic, but the book is there. Even if I don’t feel anything, the words enter my consciousness. I find snippets of phrases pop up during the day, to ground me. And when I do pray spontaneously, it’s usually a combination of the words that I’ve repeated. It helps that the prayers written in the BCP are beautiful. They use direct, visual, active language. They are efficient and succinct. They both have plenty to say, but they don’t prattle on. They say enough. One doesn’t need to be constantly talking to God. One can just move on and do the work. Prayers from the book let words be words. They take away the responsibility for a perfect prayer, the right words, from the speaker, and just let’s the speaker’s heart be what it is. However, the prayerbook is not sacred. It’s flexible. It offers room for others. At the convention, we can add more. In many places, the prayerbook is where we best explain Episcopal teaching. The prayers within the marriage rite exemplify the church’s theology of marriage. Likewise, the ancient burial prayers say what needs to be said about what we think of death. The prayers are miniatures of longer stories. Canon law is fine, but prayer is prior. The prayerbook is efficient and egalitarian. I think people confuse “order” with hierarchy, conformism and taboo. Actually, order is about efficiency. It provides the minimum. Anyone can, for example, bless anything: a car, a squirrel, parmesan cheese. But the prayerbook provides the basics. Furthermore, when a priest is not present, we can change the pronouns – because the gathered people are the church. Order also ensures not everyone has to worry about everything. Let the Bishops worry about church. The rest of us have these simple prayers, and we can deal with life. Sometimes Episcopalians say they don’t know much about the bible. The prayerbook, however, has also compiled the scripture that’s useful for personal edification. We may all want to read the bible cover to cover, but if the time isn’t there, the prayerbook has plenty of verses. We know more about scripture than we think; and it’s used for prayer, rather than as a rulebook or a hammer. Being a “prayerbook” Christian is not better than any other sort of Christian. However, it it allows the reader to be relaxed about faith, rather than filled with anxiety about perfection or God’s response. Our strength becomes more easily woven into the everyday, for we can be liberated from worrying about how to please Him.